This guide will help you find information, tools and resources on citation and style. Want to View a Sample Paper? Need More Help with Chicago? Use this system if you want to use footnotes. More common in arts & humanities fields, especially History. Use this system if you are mostly using in-text, parenthetical citations (not footnotes). More common in sciences and social sciences. Need More Help with Turabian? The Turabian handbook interprets Chicago Style in an easy to understand way for students. It is still Chicago Style. A Quick Guide is available online from the publisher. The Turabian handbook interprets Chicago Style in a more streamlined way for students & researchers. If you aren't sure which citation style to use, be sure to ask your professors which style they prefer for assignments. Two systems: Chicago has two systems. The "Notes & Bibliography" system uses footnotes or endnotes. The "Author-Date" system uses in-text citations. Ask your professor which system they prefer. Example footnote: 2. Scott Lash, Economies of Signs (London: SAGE, 1993), 241. Bibliography heading: Use "Bibliography" as page heading. Online resources: Give the URL, DOI (Digital Object Identifier), or database name. Use in-text citations for the Author-Date system. (Author last name year, page number). Include a Bibliography at the end. Note that the date is after the author instead of at the end as with the notes-bibliography style. Example: Smith, Zadie. 2016. Swing Time. New York: Penguin Press. 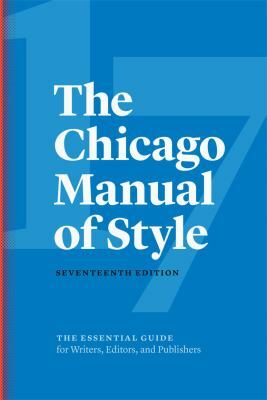 See Chicago Manual of Style Online for a basic overview of the author-date system structure. For examples see Author-Date Sample Citations. Chicago short-title citation: when you cite the same title more than once, you may use a shortened form after the first full citation: surname(s) of author(s), shortened title, page number [if available]. 1. Mary N. Woods, Beyond the Architect’s Eye: Photographs and the American Built Environment (Philadelphia: University of Pennsylvania Press, 2009), 199. 2. Woods, Beyond the Architect's Eye, 233. Woods, Mary N. Beyond the Architect’s Eye: Photographs and the American Built Environment. 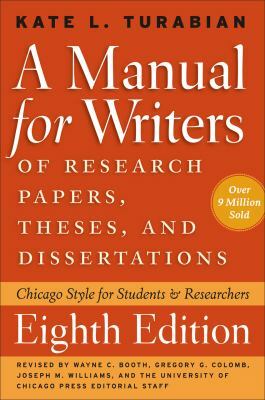 Philadelphia: University of Pennsylvania Press, 2009. For Chapters in edited books see 14.112 Contribution to a multiauthor book. Same as book, but add source of online edition or eBook. Electronic sources do not always include page numbers, so it may be appropriate in a note to include a chapter or paragraph number (if available), a section heading, or a descriptive phrase that follows the organizational divisions of the work. 1. Jane Austen, Pride and Prejudice (Newburyport: Dover Publications, 2012), Ebook Library edition. 2. Austen, Pride and Prejudice, chap. 24. Austen, Jane. Pride and Prejudice. Newburyport: Dover Publications, 2012. EBook Library edition. 1. T. H. Breen, “Will American Consumers Buy a Second American Revolution?,” Journal of American History 93, no. 2 (2006): 405. 2. Breen, “American Consumers," 406. Breen, T. H. “Will American Consumers Buy a Second American Revolution?” Journal of American History 93, no. 2 (2006): 404-8. Same information as print, but add the access date and article DOI (Digital Object identifier) at end. If no DOI is available, add the URL of the article, or if from a database, the database name instead (see Chicago 14.271). 1. Brian Lennon, “New Media Critical Homologies,” Postmodern Culture 19, no. 2 (2009): 23, accessed May 5, 2014, http://dx.doi:10.1086/599247. 2. Lennon, “New Media Critical Homologies,” 20. Lennon, Brian. “New Media Critical Homologies.” Postmodern Culture 19, no. 2 (2009). Accessed May 5, 2014. http://dx.doi:10.1086/599247. Lennon, Brian. “New Media Critical Homologies.” Postmodern Culture 19, no. 2 (2009). Accessed May 5, 2014. Project Muse. Include the URL for the article. 1. Katharine Mieszkowski, “A Deluge Waiting to Happen,” Salon, July 3, 2008, http://www.salon.com/news/feature/2008/07/03/floods/index.html. Mieszkowski, Katharine. “A Deluge Waiting to Happen.” Salon, July 3, 2008. http://www.salon.com/news/feature/2008/07/03/floods/index.html. For online newspaper articles, add the URL for the article at the end of the elements of a print citation; if the URL is very long, use the URL for the newspaper’s home page. If from a database, include the database name (see Chicago 14.271). Page numbers may usually be omitted. For more examples of basic elements, see Chicago 14.203. 1. Julianna Morales, “Middlebury Residents React to the Election,” The Middlebury Campus, November 17, 2016. 2. Doyle McManus, “The Candor War,” Chicago Tribune, July 29, 2010, http://www.chicagotribune.com. McManus, Doyle. “The Candor War.” Chicago Tribune, July 29, 2010. http://www.chicagotribune.com. McManus, Doyle. “What Others Are Saying.” Chicago Tribune, July 29, 2010. ProQuest. For most Web sites, include an author if a site has one, the title of the site, the sponsor, the date of publication or modified date (date of most recent changes), and the site’s URL. If a site does not have a date of publication or modified date, give the date you accessed the site. 1. “McDonald’s Happy Meal Toy Safety Facts,” McDonald’s Corporation, accessed July 19, 2008, http://www.mcdonalds.com/corp/about/factsheets.html. Cite book reviews by author of the review and include book title and author(s) or editor(s). Follow applicable guidelines for citing periodicals. 1. B.J. Murray. Review of Chamber Music: An Essential History, by Mark A. Radice. CHOICE: Current Reviews for Academic Libraries, Sept. 2012: 93. Accessed Oct. 21, 2014. Academic OneFile. Murray, B.J. Review of Chamber Music: An Essential History, by Mark A. Radice. CHOICE: Current Reviews for Academic Libraries, Sept. 2012. Accessed Oct. 21, 2014. Academic OneFile. 1. Sherlock Holmes, directed by Guy Ritchie (2009; Burbank, CA: Warner Home Video, 2010), DVD. Sherlock Holmes. Directed by Guy Ritchie. 2009. Burbank, CA: Warner Home Video, 2010. DVD. The form for citing unpublished, archival materials is less standardized than for published sources. Adopt a consistent form in your work. Describe the item in the Notes, but describe only the collection or archive in the bibliography (unless you cite only one item from a given collection). 1. Name of author, "Name of item," date (date-mo-year), Name of collection, Item locator, Repository. Name of collection, Name of repository. A2 President Brainerd, Middlebury College Special Collections and Archives. 1. Ruth Hesselgrave, Scrapbook of Ruth Hesselgrave, class 1918, circa 1915-1919, College Archives, Middlebury College Special Collections and Archives. College Archives, Middlebury College Special Collections and Archives. 1. Photograph of Ezra Brainerd, Middlebury College President, 1864, College Archives A2 PF, Middlebury College Special Collections and Archives. No bibliographic entry is required for photographs. Put all required information in the footnote or text. Citing Special Collections and Archives by Middlebury College Special Collections. An annotated bibliography includes a citation and a written statement or abstract about each work to help potential readers decide if an item is relevant to their interests. Middlebury College Library Citation Guide - section describing annotated bibliographies with examples.